If you choose to educate your child at home (or plan to) we invite you to come and join us for our first Home Education Fair. Parents who attend will have the opportunity to meet a wide range of services able to offer their children support with education. 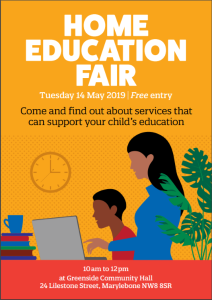 The fair takes place on Tuesday 14 May 2019 at Greenside Community Hall, 24 Lilestone Street, Marylebone, London NW8 8SR. YOu can drop in any time between 10am and 12pm. Download the flyer for the event by clicking here.